Dashnak Armenian overprints on Imperial Russian Romanov stamps are always philatelically-inspired and very often forged. 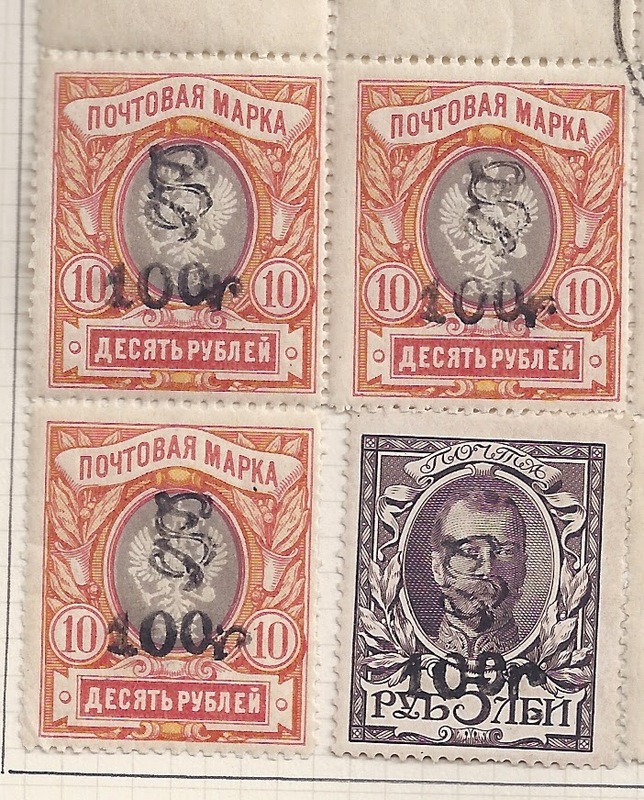 On two values - the 4 kopeck and the 10 / 7 kopeck - genuine overprints are quite common and they can be found in multiples. 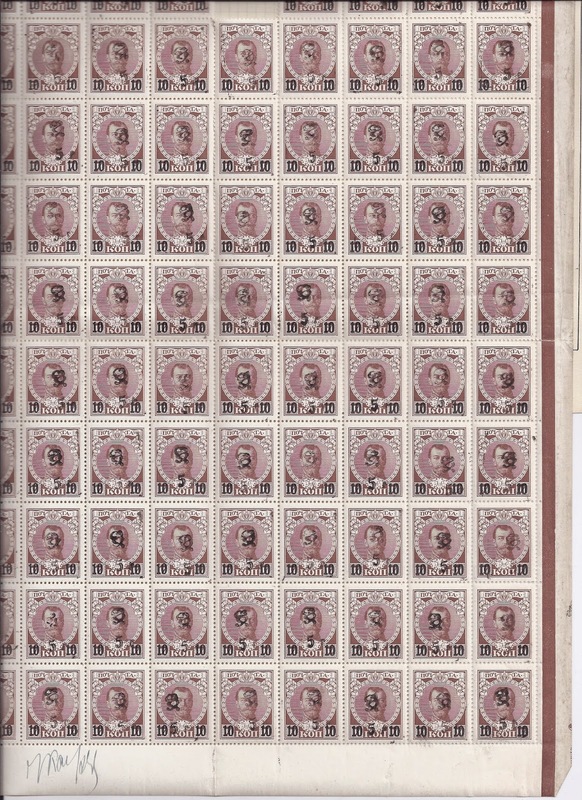 Above, for example, is part of a complete sheet of 100 (minus one stamp ...) in the Peter Ashford collection which is surcharged with the 5 rouble (Type 3) overprint. In the bottom left corner you can see the ink signature of Kaushavili, an early dealer in this material - he sold to Agathon Fabergé, notably - and whose signature is a good guarantee of authenticity. It seems clear that the 4 kopeck and 10 / 7 kopeck stamps were still in the stocks of the Armenian post office in 1920, probably several thousand of each value, in sheets. But it is doubtful that any other values were held in anything but part sheets - and for some values I think that overprinted copies were brought to the post office in Yerevan by collectors/ dealers for surcharging. Genuine copies of surcharges on these other values of the Romanov stamps are extremely rare and forgeries are much more common. The chalk paper of low value Romanovs and the recess printing of the high values are both unsuitable for surcharging by hand. Weak and smudged prints on the 4 kopeck and 10 / 7 kopeck are common. This makes expertising more difficult. Recently, for the first time, I obtained a 100r surcharge on a 5 rouble Romanov. I show it below grouped with a block of three 10 rouble stamps also surcharged 100 roubles and, once again, from the Ashford collection. I think the overprint on the 5 rouble Romanov is genuine - the characteristic features one looks for are there. The ink seems a bit denser but that may be deliberate - it makes the overprint on a dark background a bit clearer. 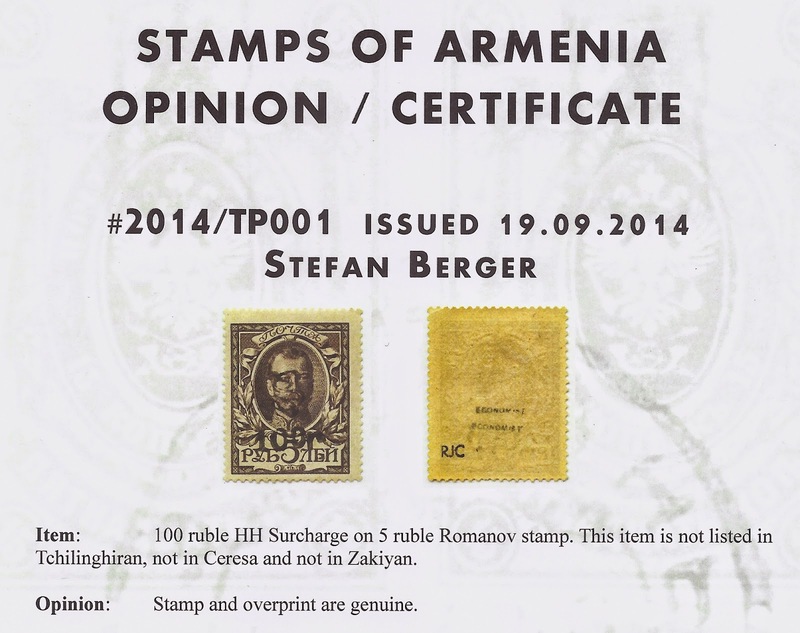 But I will want Stefan Berger's Opinion before I am willing to sell this stamp as genuine. The stamps is signed, twice, ECONOMIST, and it has the house mark RJC of Dr Ceresa.